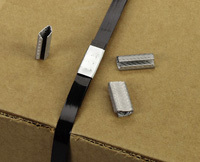 An easy to use and economical solution to improve bundling and packaging efficiency. 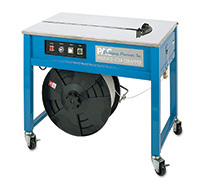 Light-weight, portable, semi-automatic machine works with polypropylene strapping only. Short width of slide table makes bundling irregularly shaped items easier. Open strapping area makes it easy to identify when a new roll needs to be loaded. Allows for adjustment of strapping sizes from 1/4" to 5/8" and adjustable tension ranges from 10 - 100 lbs. 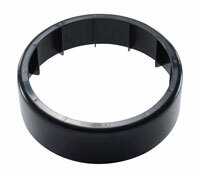 Machine heat seals the strapping so seals are not needed. Requires a 110 or 220 volt power source.